(Nanowerk News) The future of electronics could lie in a material from its past, as researchers from The Ohio State University work to turn germanium—the material of 1940s transistors—into a potential replacement for silicon. 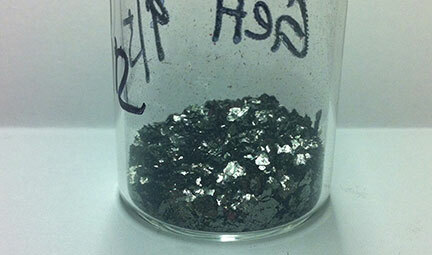 At the American Association for the Advancement of Science meeting, assistant professor of chemistry Joshua Goldberger reported progress in developing a form of germanium called germanane. The element germanium in its natural state. Researchers at The Ohio State University have developed a technique for making one-atom-thick sheets of germanium for eventual use in electronics. In 2013, Goldberger’s lab at Ohio State became the first to succeed at creating one-atom-thick sheet of germanane—a sheet so thin, it can be thought of as two-dimensional. Since then, he and his team have been tinkering with the atomic bonds across the top and bottom of the sheet, and creating hybrid versions of the material that incorporate other atoms such as tin. The goal is to make a material that not only transmits electrons 10 times faster than silicon, but is also better at absorbing and emitting light—a key feature for the advancement of efficient LEDs and lasers. As they create the various forms of germanane, the researchers are trying to exploit traditional silicon manufacturing methods as much as possible, to make any advancements easily adoptable by industry. Aside from these traditional semiconductor applications, there have been numerous predictions that a tin version of the material could conduct electricity with 100 percent efficiency at room temperature. The heavier tin atom allows the material to become a 2D “topological insulator,” which conducts electricity only at its edges., Goldberger explained. Such a material is predicted to occur only with specific bonds across the top and bottom surface, such as a hydroxide bond. Goldberger’s lab has verified that this theoretical material can be chemically stable. His lab has created germanane with up to 9 percent tin atoms incorporated, and shown that tin atoms have strong preference to bond to hydroxide above and below the sheet. His group is currently developing routes towards preparing the pure tin 2D derivatives.